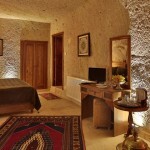 Turkish Cave House Hotel is conveniently located in the heart of Cappadocia in Ortahisar. 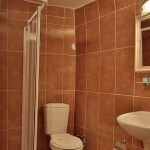 Ortahisar is an ideal base to visit the surrounding sights. 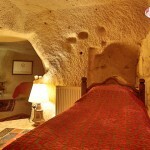 Göreme Open Air Museum, the famous open-air museum of Goreme and popular destinations in Cappadocia like Urgup and Uchisar are in close proximity. 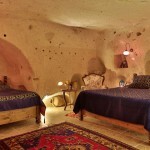 At the foot of Ortahisar Castle, one of the most important castles of Cappadocia, Turkish Cave House was an old village house which has been entirely restored by hand in from 2013 to 2014 and has now become a small boutique hotel with 6 rooms. 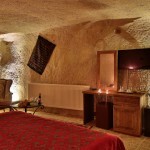 The combination of the mystical atmosphere of Cappadocia and authentic atmosphere of our modest hotel weaves for our guests a holiday experience to remember, away from the stress of everyday life. 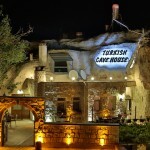 In addition, the location of Turkish Cave House enshrouded in red as the sun sets offers a spectacular view of the Red Valley and the sunset point only 2 kms away.